Figure 11-10. 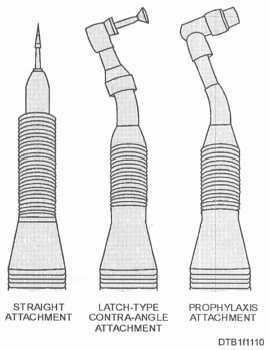 - Selection of attachments for the slow-speed handpiece, including (from left) straight, latch-type contra-angle, and prophylaxis attachment. Fiber optic accessories provide the operator a source of artificial illumination through the dental handpiece. The clinical applications of a fiber optic handpiece are almost limitless. It is useful in general inspection and transillumination of the oral cavity and tooth structure to help identify and diagnose inter-proximal caries, stains, decay, calculus, crazing and hair line cracks in natural and artificial teeth, location of excess cement, and smoothness of crown preparations. Most fiber optic systems are activated by touch or an air-electric switch. Many systems also have an intensity control that permits adjustment of the light intensity to suit individual preferences and needs. Fiber optic technology involves the transmission of light through long, thin fibers of glass or transparent material. The light travels, nonelectrically, through the fiber by reflecting from wall to wall without transmitting or generating heat. This makes fiber optics completely safe for use in the oral cavity. Each individual fiber is approximately 25 microns in diameter, or about 1/3 the size of human hair. A cluster of fibers is called a fiber optic bundle. The bundles are enclosed inside the handpiece and 11-14 positioned to direct the light along the same line as the dental bur. Level I maintenance on the fiber optic system is to clean the fiber optic surfaces on both ends of the handpiece after each patient. To do this, wet a cotton swab with isopropyl alcohol and clean both ends before the sterilization cycle. This prevents residual debris and handpiece lubricant from baking onto the fiber optic surfaces, which results in reduced light output. Read the manufacturer's instructions for additional care, maintenance, and bulb replacement requirements. This type of handpiece attaches directly to a small electric motor and is normally used in the prosthetic lab. 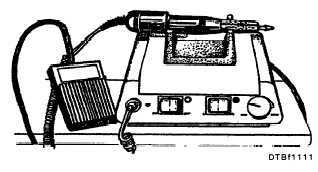 The electric handpiece is portable, lightweight, and has variable speeds of 2,500 to 25,000 rpm (fig. 11-11). Units are initially activated by an on/off switch and controlled by a foot switch. Another switch controls the left or right torque action similar to the forward and reverse of the low-speed handpiece. The electric handpiece uses long, smooth-shanked rotary instruments. Electric handpieces require minimal maintenance and adjustments. Consult the manufacturer's instructions for specific requirements and guidelines. Figure 11-11. - Electric handpiece.